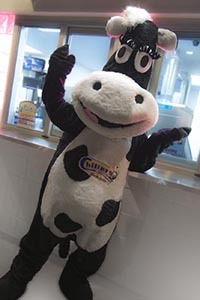 Chillers Ice Cream first opened their windows in 2008 in Sellersburg, Indiana. The Chillers concept, however, wasn’t born then and there. It has been growing into what it is today ever since 1966. That’s the year Don and Dottie Rosenbarger decided to go into the ice cream business. Back in 1966, there was an ice cream shop, in New Albany, Indiana that was for sale. It was called Zesto. This ice cream store was failing, and it was part of a failing national franchise that was quickly going out of business. Don and Dottie saw an opportunity to create something unique and jumped at the opportunity to purchase it. With this they bought their first ice cream store, and Zesto was reborn. When they bought the store, they kept the Zesto name but added their own “keeping it simple” philosophy to everything else. Don and Dottie knew from the very beginning that if they kept it simple, they would create something extraordinary! Working with a local mix manufacturer, they did just that. They knew they had great ice cream to serve to their customers, but they didn’t want to stop with that. They wanted to also create a place that had superior service and spotlessly clean facilities, while always remains true to selecting the most premium ingredients available. In 1966, they put their plan into action. They started with an extremely simple menu, only offering vanilla soft serve, shakes, ice cream cones, and sundaes. In 1974, Zesto added chili dogs and popcorn to their menu. It wasn't until 1986, when employees started to bring their own cheese to add to their hot dogs, that Don took notice of this and decided to add cheese to the menu. After that, the 1980s brought chocolate soft serve. Previously, vanilla had been the only flavor of soft serve ice cream that a customer would ever think of choosing. This eventually led to one of the most popular treats Zesto has ever introduced, the “Cyclone” and was later renamed the "Vortex". That brought on a sudden craze for new ice cream flavors, and Zesto was there to oblige. 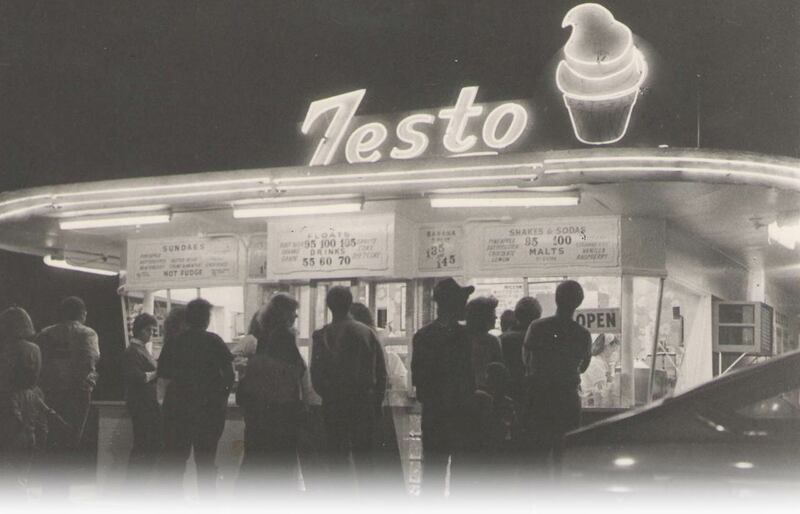 Over the years people took notice of Zesto's popularity. They saw that night after night, long lines ran into to the street, and they wanted to become part of something so special. Every year people offered to franchise Zesto’s business concept, but such offers were always turned down back then. Don and Dottie were never interested in franchising their concept, and neither was their daughter Lisa, who took over the store in 1999 when her parents retired. The third generation was interested, however, and took steps to finally offer a franchise concept that people have wanted for years. 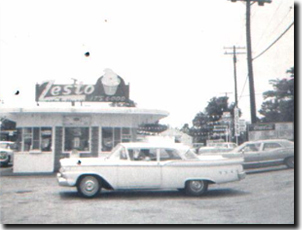 When franchising began, the biggest hurdle encountered was having to change the Zesto name. Over the 40+ years that Zesto has been in business, their name had unknowingly been trademarked, which is a key element in franchising. Undeterred, they created “Chillers” and quickly trademarked this name in 2006. After years of meetings, fees, and waiting for government approval, Chillers became an official franchise in 2010. Back in 1966, Don and Dottie never envisioned their dream would become a franchise. With lots of hard work, their “keeping it simple” philosophy, and strong emphasis on the customer, they managed to create one. The name may have changed but their concept has not. Over the 40+ years of business, Zesto and Chillers has had to constantly change to keep in touch with the customer’s changing taste buds. Constantly learning and always staying true to who they are as an organization has made Zesto so successful in the past, and will keep Chillers just as successful in the future. 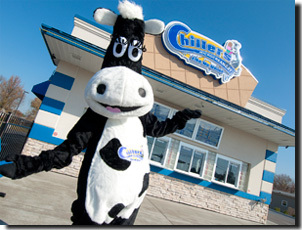 January 2011 – Chillers starts franchising in Indiana and Kentucky. 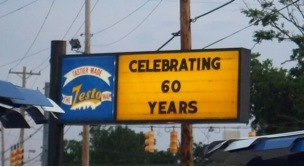 August 2011 – Zesto (Chillers parent company) celebrates their 60th anniversary. 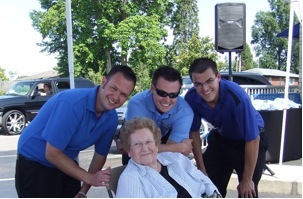 August 2011 – Franchise owners with Co-Founder Dottie Rosenbarger after celebrating 60 years of business. 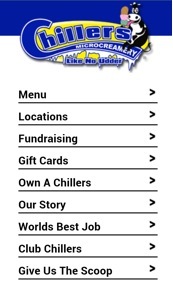 February 2013 – After listening to customer demand, Chillers launches mobile website. 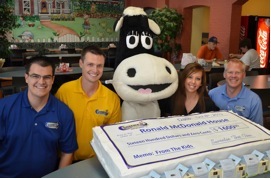 August 2013 - Ronald McDonald House receives $1,600 Ice Cream Cake Check donated from Chillers Ice Cream. 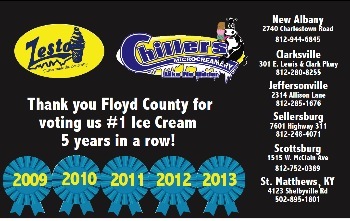 September 2013 - Chillers receives Best Ice Cream Award for the New Albany Tribune Readers Choice 5 years running. 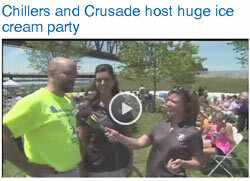 June 2014 – WHAS Crusade for Children and Chillers team up for the World’s Largest Ice Cream Party at the big four bridge. © 2010-2019 Chillers Franchise Inc. All Rights Reserved.